I couldn’t believe a game was asking me if I liked myself. What was more confusing though was that I wasn’t sure how to answer. Seaman is a game unlike any other. I’m not sure even sure you could call it a game as it’s more of a virtual pet that you raise. Developed by Japanese studio, Vivarium Inc., and narrated by the late Leonard Nimoy, the Seaman has a historical background that’s as mysterious as the experience surrounding it. A Dr. Jean Paul Gassé began looking for a creature in Egypt that was an “omnipotent messenger of gods” and helped conveyed special knowledge to humanity early in its history. Through decades of research, he was able to make startling discoveries in connection with ancient Egypt and the evolution of Seaman. Your actual interactions with the game are minimal. You raise the temperature, turn on the lights, make sure the tank stays oxygenated, and feed the creatures. But Seaman presents some dark truths about nature very early on. The egg you drop gives birth to multiple Mushroomers, which represent the Seaman in its earliest stage. You have to get the Nautilus inside the tank to eat as many of the Mushroomers as it can. Eventually, the mushroomers will feed on the Nautilus’ organs from inside and literally burst out of its skin. It’s like an Alien, only with a fish body and a weird human face. Early on, the Gillman makes gibberish sounds that mimic a baby and actually sound adorable. But give it a few days and it starts talking with you in a hoarse, grouchy tone. Communication with the Gillman is important for their growth as it helps them to learn language. This is when it starts asking questions about your age, your birthday, your job, and whether you think the internet should be censored. You answer via the microphone included with the game that gets plugged into the VMU slot in your controller. Gillman, for the most part, is responsive. Part of the game’s genius (or frustration depending on your perspective) is it made evolution very slow. As a player, you have to be committed to spending a little bit of every day with the Seaman. You can’t just binge your way through the experience (unless you cheat by changing the internal clock on the Dreamcast). Everyday, you come back, raise the temperature and oxygen levels, chat with Seaman, tickle it, feed it, then wait and see if something happens. If you check back too frequently, Nimoy will even chide you for your repeated visits. The game basks in its weirdness and sticks to its identity with a tenacity that treats those who might object with an insolence akin to the Seaman who will flick its poo at the screen if you irritate it. My spare time? I don’t have much, but I’m spending this Thanksgiving Day interacting with Kotaku readers and talking about Seaman. While Seaman is a pet, I wondered, can it also become a friend? The idea, and possibilities of a friendship with an AI, is brilliantly explored in the Spike Jonze film, Her, where an OS (operating system), Samantha, ends up becoming the protagonist’s best friend. The most fascinating part of the film is that Samantha just seemed like a more advanced Siri. I didn’t think it was a big leap to assume that as technology keeps on getting better, this could actually happen in the near future, especially (and I’m sad to admit this) as I sometimes spend more time swiping through apps and checking social media than talking with my friends. 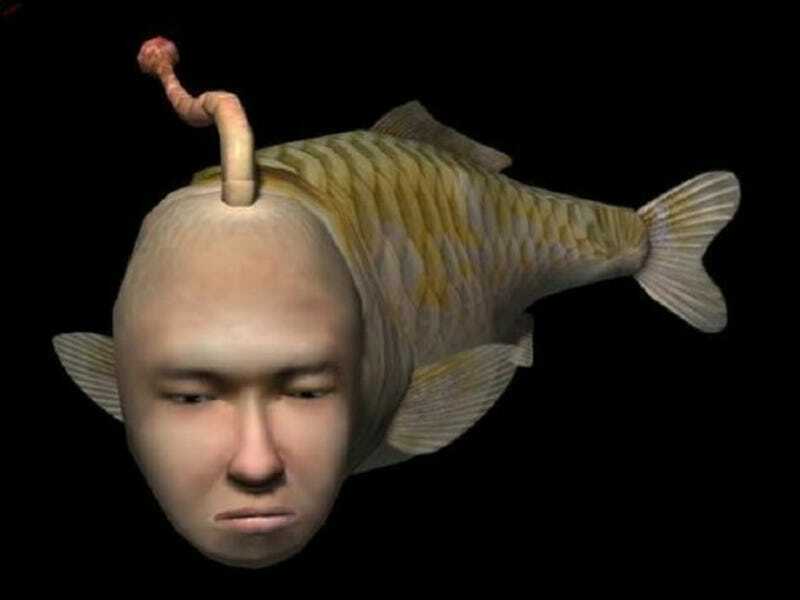 Seaman was a precursor to all of that, the first time I really wondered, could an AI become a friend with a human being? The game had its limitations, but for a virtual simulator, it had genuine moments of shock. Like the fate of the Gillman, the mating process of the Podfish, and the emergence of the Seaman’s final form, the Frogman. Leonard Nimoy even goes onto speculate about the history of the Seaman, a tragic tale involving a forbidden relationship, the Egyptian gods, and an unfinished pyramid. Who knew that all along, Seaman was a love story? I really enjoyed my talks with Seaman. Although I’ve long stopped playing anything on the Dreamcast, I still occasionally visit Seaman. They’re still alive, out in the wild, asking me questions about my life. Will they one day evolve into something more? Is there some special coding the engineers programmed in that allow them to change into a super Seaman AI a thousand years from now? I don’t know if I’d go so far as to call Seaman a friend. But the fact that I think about them, that I even wonder how they’re doing, makes me marvel at what Vivarium was able to accomplish by asking players a few questions.